Umage boolean button+ Change the off and on label mannually and set the foreground colour to red while cheking the use foreColor alarm sensitive option. Thanks for the explanation about the rule. I also tried that solution but then i would have to do what Luca said (add a click event). In my solution everthing works (nt the best way because the text field do not come from the PV) and no rules are added. A prover widget for this we be nice indeed. You can change the value of almost any attribute of a CSS widget. There are predefined attributes listed in the Rules property that can change the behavior of a widget based on the value of a PV. 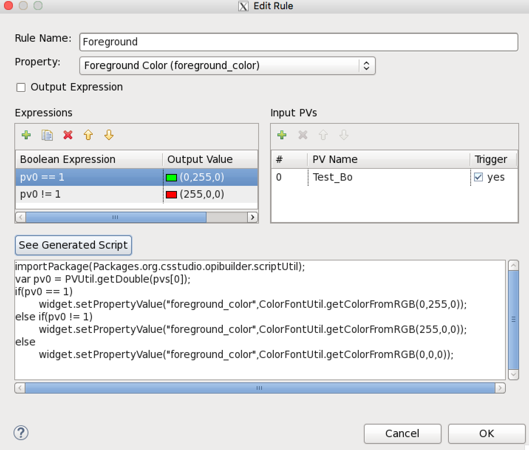 The screen shot below shows how to define a foreground color rule based off a PV to be green when value is 1, else turn red. I also need to click over it to change the state. The only way i have so far is in fact to use the Image boolean button. I set the one severity field (OSV) to major .Then set in CSS the foreground to green and checked the ForeColor Alarm Sensitive to yes. But I am still not able to automatically use the ONAME and ZNAME fields in CSS so I have to manually set the ON and OFF label. if you need to display only a text label you can use a Text Update widget with the transparent flag set, plus (as already suggested) a rule to change foreground color upon PV value. I would like to do two things with my bo records in CSS. 1. Have a text that is according to the ONAM and ZNAM pv fields.